When children have begun to master the letter names and sounds, it is time to start building simple three letter words. 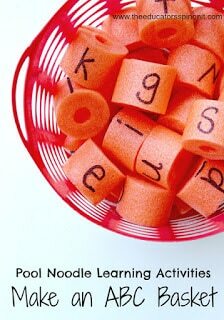 These pool noodle build word towers activities are a great way to combine literacy with a little engineering. It is perfect for the child who enjoys learning through movement and play. Here’s how to play this Pool Noodle Game. 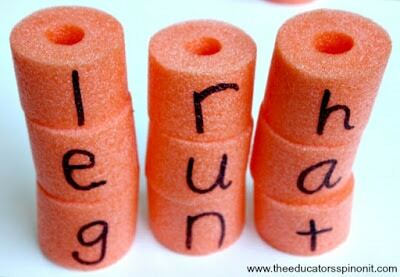 Learning Objective: Read simple 3 letter words. Click here for directions on how to make the ABC Beads. 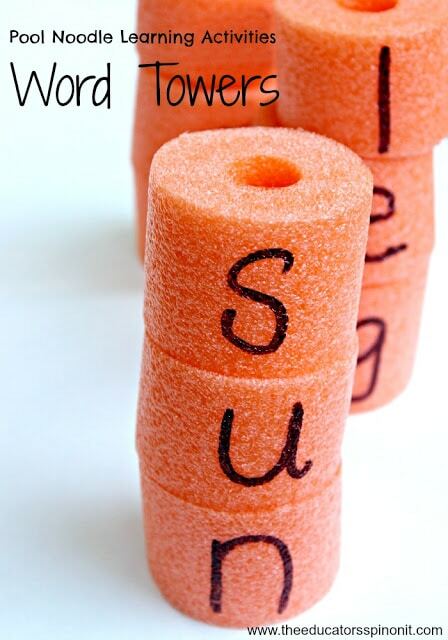 How to Play Pool Noodle Word Towers. 1. Say a simple three letter word. 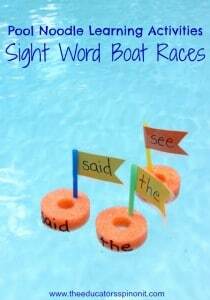 Here are some sample 3 letter words that follow the classic sound patterns to get you started. 3. Knock the word over. 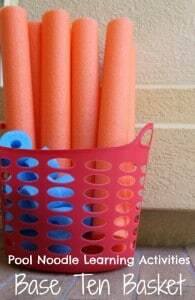 Which Pool Noodle Ideas will you try first? This is a cute idea! I’m just wondering how experienced with literacy the kiddos need to be in order to put the letters together for the tower. Looking at it, it seems that they would need to understand how to manipulate the letters since they have to be built backwards in order to read them. I’d love to hear your thoughts on how to explain this. Please know I am not being critical –AT ALL–rather, I’m looking for advice on an explanation to the kiddos. Thanks so much. I sure hope to use this with my niece this summer. (Also might be good for order numbers forward and backwards). You can put them side by side first, then stack them. Which gives them repetition with the same sounds, experience making the word the “traditional” left to right and building! I would say, kids need to have a pretty good understanding of letter sounds. The typical age is K-1st grade, some kids learn older and younger too.